Stop worrying about termites! -You've found the answer. The Easy-to-see Termite Window. 100's of uses both inside AND outside your home. Just 99 cents each. 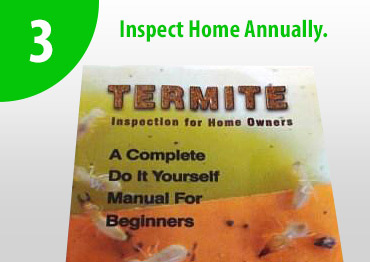 eBook available - Only $38.50 100% Money Back Guarantee Or use a professional to check your home for termites. There are plenty of reasons why!! Early interception and detection of termites. Positive and confirmable eradication of termites and their central nest. Simply superb success rate. Will not attract termites to your house, but consistently intercept scouting termites that approach your home. D.I.Y has never been easier. Your baits can be serviced easily by any licensed pest control company in Australia. 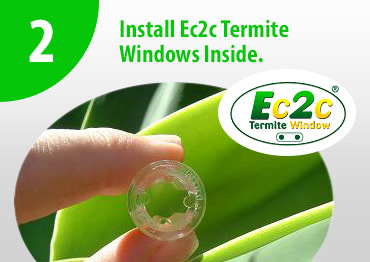 Suitable for several termiticides including, Termidor®, Intrigue®, Premise®. The Green Termite Bait System gives you peace of mind knowing that you can destroy their home before they get to yours. Straight forward, uncomplicated and environmentally friendly system. Hey Guys, I had my first bait station go off and I have just finished poisoning the termites. I want to thank you for such a great product and will be looking forward to their elimination. Researched alternatives and was most impressed by your baits as simple and reasonable value. Green Termite Bait Systems is a sister company to Green Pest Control. We commenced trading in 1988 as One Go Pest Control on the Gold Coast. It was founded by Jerry Furnell (P.C.O. Lic. 2143) with just one aim... To provide excellence in service for every client. Making sense of termites. What to do if your neighbour has termites and won’t eradicate them. 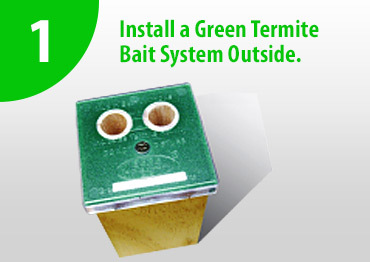 Simply use the Green Termite Bait System to protect your home and stop worrying about Termites.